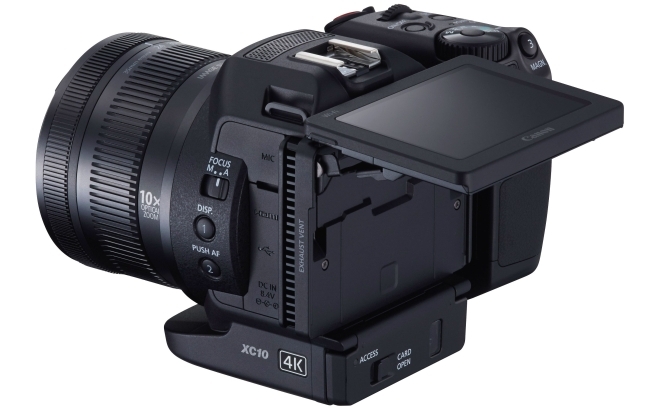 The XC10 has a 1-inch type, 12 megapixel CMOS sensor for shooting videos and stills. The camera has a fixed wide angle optically stabilized lens with 10x optical zoom. It has a 35mm equivalent focal length of 24.1-241 mm for stills and 27.3-273 mm for videos with a variable f2.8-5.6 aperture. 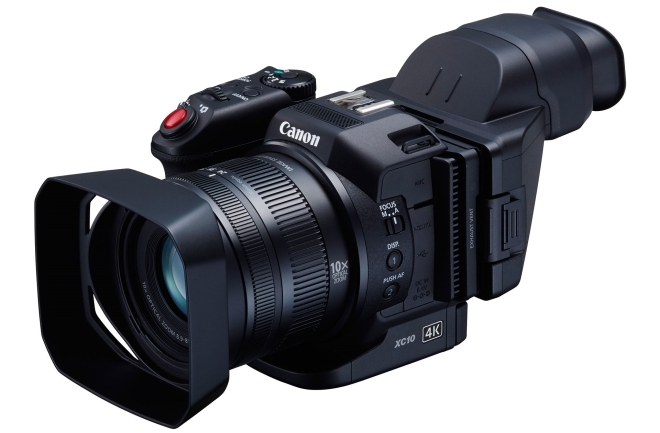 The camera can shoot H.264 4:2:2/8-bit MXF 4K UHD (3840 x 2160) movies to an internal CFast card in the XF-AVC Intra codec or Full HD (1920 x 1080) video in XF-AVC Long GOP to an SD card at multiple frame rates up to a maximum of 305Mbps/29.97P in 4K and 50Mbps/59.94P in Full HD. The XC10 also supports Canon Log profile and has 12 stops of dynamic range. It can shoot 12 megapixels stills normally and also 8 megapixels still during video. The ISO range goes from 160-20,000. The XC10 has a rotating handgrip, rotating touchscreen display, built-in Wi-Fi, and HDMI 1.4 output. The XC10 will be available in June for $2,499 with SanDisk 64GB CFast 2.0 card and card reader.